Pennybacker accepts an invitation to speak at Berry and describes her travel plans. Her itinerary for speaking engagements in February is enclosed. 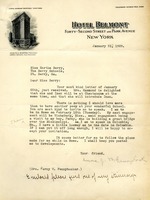 On stationery from New York's Hotel Belmont.